Mutineers, we have our first brown Governor. Join me, as I bold my favorite parts of the NYT article which declares this history-making outcome. Bobby Jindal, a conservative Republican congressman from the New Orleans suburbs and the son of immigrants from India, was elected Louisianaâ€™s governor Saturday, inheriting a state that was suffering well before Hurricane Katrina left lingering scars two years ago. Mr. Jindal, 36, defeated three main challengers in an open primary, becoming this stateâ€™s first nonwhite governor since a Reconstruction-era figure briefly held the office 130 years ago. With more than 90 percent of the vote counted, Mr. Jindal received 53 percent, above the 50 percent-plus-one threshold needed to avoid a runoff in November. He will be the nationâ€™s first Indian-American governor when he takes office in January. Have I popped champagne? Yes, I have. No, I don’t believe in teaching Intelligent Design, I certainly am not an advocate of getting rid of a woman’s right to choose and I still support hate crime legislation. I can guzzle bubbly despite all that, because there’s something else stirring within me– recognition that someone who looks like me did something so significant, combined with an uncomplicated thrill over the fact that Bobby made history. There are so many valid reactions to Jindal; I know about them because thanks to Amardeep’s post, we have hosted a lively discussion regarding his background, his policy positions and the greater implications of his politicking, for “the community”. Amardeep’s thoughts resonated with many of us who are conflicted about Louisiana’s new Governor. The good news is, there are no wrong reactions. Each of us is allowed to feel how we do, so while some of you gnash your teeth, I’m happy for him and by extension, us. Better than that, the next time some little kid decides that they want to be in government when they grow up, their immigrant parents now have a visual, a template, a precedent to latch on to, much the same way my English minor was suddenly acceptable once Jhumpa won. There is much to do, much which is owed to the great state of Louisiana and her people; this is just the beginning of that story and I idealistically hope that it has a happy ending. What Jindal can do (and really, whether he can do it) remains to be seen. But I don’t think it’s disrespectful or inappropriate to raise a glass to him tonight and wish him a sincere congratulations. Doing so doesn’t mean we buy in to his positions lock stock, neither does it mean he’s like, the greatest thing EVAR. It just means that we are happy for someone who accomplished something extraordinary. Congratulating Bobby is something I humbly think we should do, because ideally we should each choose generosity of spirit over bitterness and rancor. Choosing the former and congratulating a winner doesn’t lessen us or diminish our passionate convictions, it just demonstrates our tolerance, equanimity and good faith that we will allow a person’s actions to speak before we do, negatively and presumptously. This entry was posted in History, Identity, News, Politics by A N N A. Bookmark the permalink. ok I read over your comment again, and I guess where we differ is that I simply don’t think that racism can be divorced from its social context of class/historical context/etc., and I don’t think the significance of Jindal’s victory can be looked at without looking at it in context. And I think it’s mighty presumptuous of you to take one brown Governor as an example that America as a whole is no longer baselessly racist. Manju, I probably fall in between on the cultural relativism argument. I don’t think that certain ideologies/outlooks are intrinsically universal (social/historical context, etc., etc. ), but I do think there’s a propensity to align specific concepts of organizational and group behavior (or systems, e.g. the “market”) with a region, political outlook, etc. There are times when this is appropriate, and times when it is not. In short, I vote for the “personal politics are complex and informed by many interacting streams” argument. I have no idea of what to say to that except perhaps it’s an example of the ideas we ascribe or project onto specific people/groups. Exactly. how far is this “ascribing” or “projection” from the expectation of certain behavior based on a shared experience? 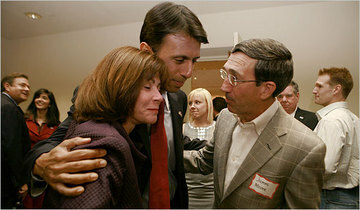 I just want to say is all you liberals were wrong about Jindal. He is doing a fine job in Louisiana. Turn your spare time in to money, no qualification required just a basic knowledge in english is enough visit http://www.dataentryoperator.co.in for further information. I have no idea of what to say to that except perhaps it’s an example of the ideas we ascribe or project onto specific people..